Begin your adverting campaign now to build 2018-19 Tourist Season into the best ever. for just $1.34 per day! 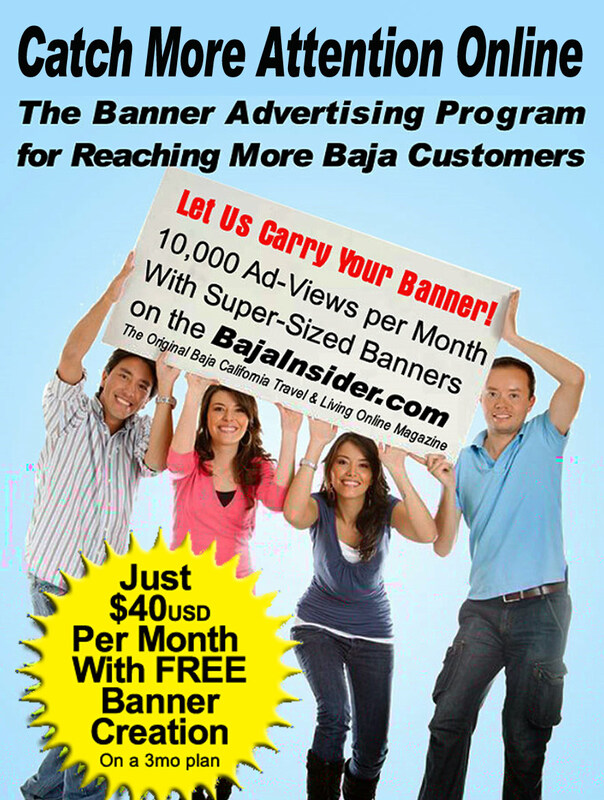 A well designed banner puts your company name & brand in front of thousands of our BajaInsider Readers every day. Although banners do not provide the full story of your business like our Content Advertising package, it is an affordable way to direct our North American readers to your Baja Busienss website to make the sale. your Banner Advertising Plan could be delivering results in just hours. Get your share of our more than 150,000 visits per month! Banners must me image or Flash format, less than 150K each. No sound. Banners must be submitted in 300x250, 728x90 Headers & 300x600 Super Skyscrapers. Banners will appear at random on all pages of the BajaInsider. Cost is just $45USD per month on a three month contract. Don't wait for print publications – Start getting RESULTS in just hours! The BajaInsider can jump start your Internet Advertising NOW!